Dr. Schmitz was born and raised in Wheaton, MN. In 1984, he received his undergraduate degree from Concordia College in Moorhead, MN. He continued his education at Marquette University School of Dentistry in Milwaukee, WI. After graduating in 1989, Dr. Schmitz returned to Minnesota to begin practicing in St. Cloud. 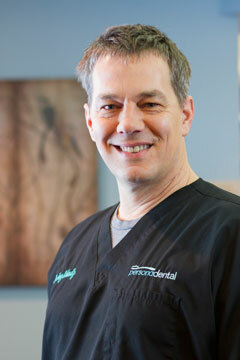 In 2007, he moved his dental practice to Sartell, MN, and founded Persona Dental. Dr. Schmitz is passionate about his profession. He is dedicated to excellence in dentistry, with an emphasis in total face esthetics, and he is committed to achieving the highest standards for his patients. Dr. Schmitz enjoys all aspects of general dentistry and has a special interest in cosmetic dentistry, implant prosthodontics, Botox ®, and Dermal Fillers. When he is not working, Dr. Schmitz enjoys fishing, hunting, and spending time with his wife, Beth, and their children, Ryan and Anna.